Previous weeks we were providing you with the weekly outcome of our research. This time we will give you the review of March! 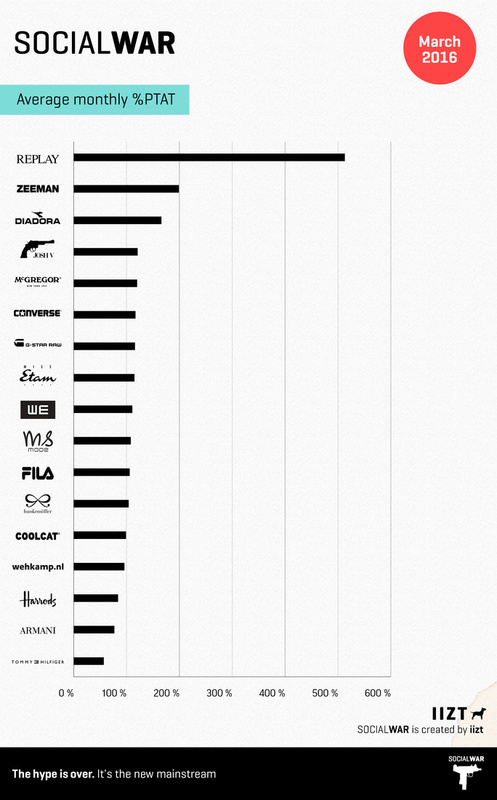 Firstly, we will show you the performance of the fashion brands on social media in numbers. 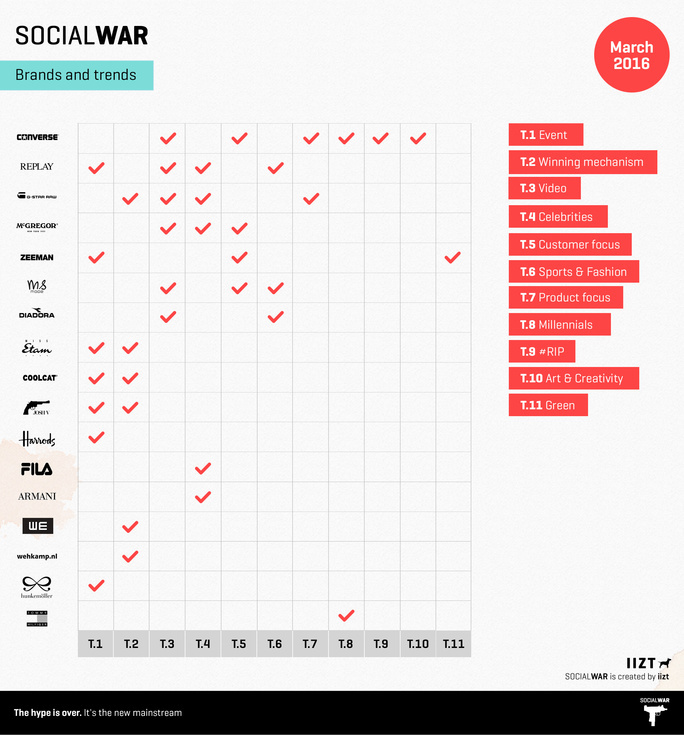 Afterwards, Social War will explain in details how these brands scored so high online! 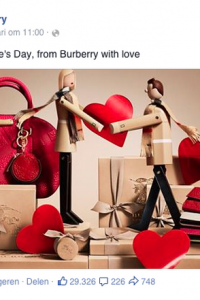 The brands had a different dynamic of raising their engagement. 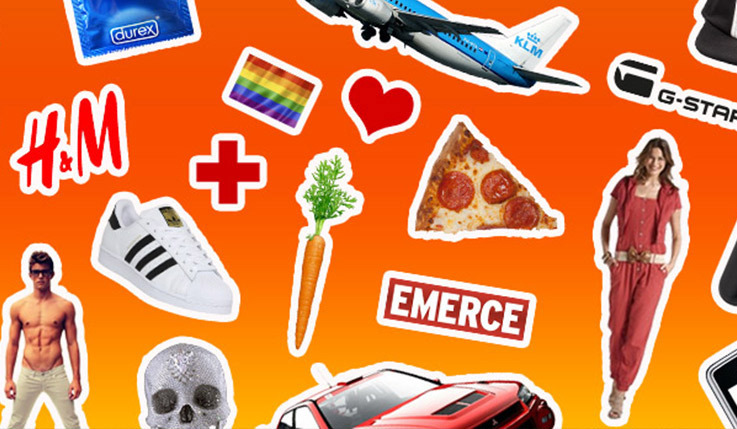 So how did these brands score that high on social media? Organizing events or creating a post related to some special occasions can give the brands a lot of attention. Replay is the leader of the month March. Replay creates an experience around the brand and brings all the classy people in “Replay The Stage”, which combines a fancy bar, high-class restaurant and flagship store. Customers think about the brand not just like about the usual clothing brand, but a lifestyle. 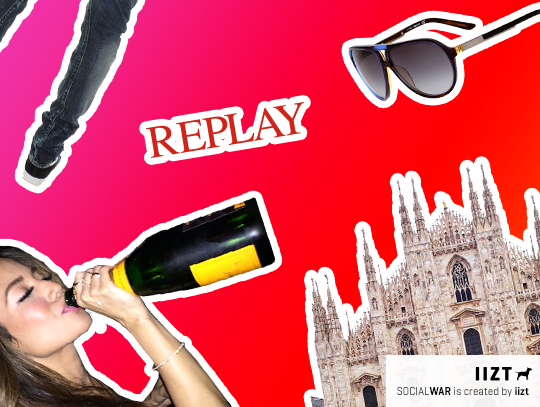 During the fashion week in Milan Replay turns their venue into mini-club inviting all fashionistas, creating a huge buzz around it and following up an engagement increase on Facebook up to 950%! People like to be entertained. Replays uses it in its favor. Hunkemoller, Miss Etam and Harrods know how to make women happy. 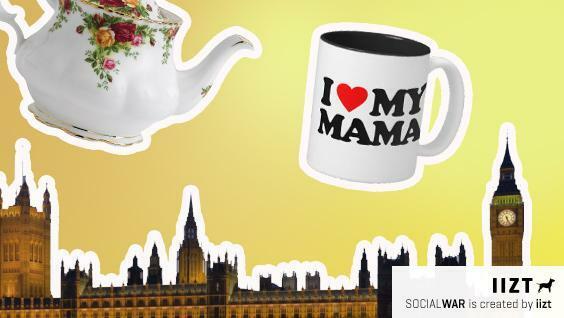 Harrods raises their Facebook engagement to 150% with an announcement of a “special afternoon tea” with a tasty goodies related to “Mother’s day”. Hunkemoller makes a 1 April joke with inflatable bra, which will give extra push up the volume. 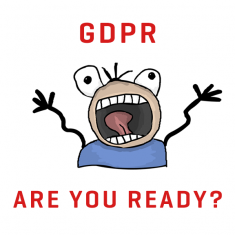 A lot of laughs about that post, while engagement of Hunkemoller raises up to 145%. Women can still find their favorite bra at the stores, without a pump, of course. Miss Etam spots women at Huishoudbeurs event and lets top stylists create their new look. 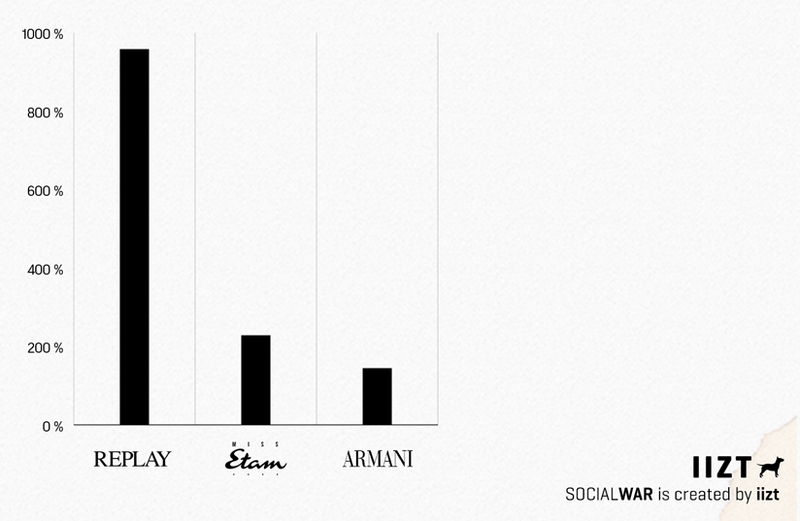 After the follow-up winning action the engagement of Miss Etam raises to almost 230%. Zeeman and CoolCat are making their followers count eggs on Easter. 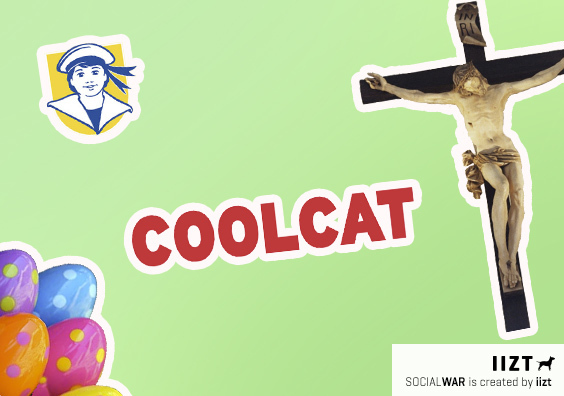 The difference is CoolCat does it better, using here the following up trend “winning mechanism”. That is why an engagement of CoolCat’s post is higher than Zeeman’s one. (175% vs 156%). Josh V is preparing their followers for Kingsday 2016. 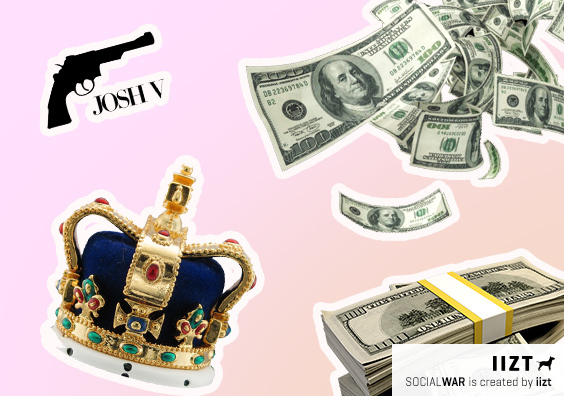 Followers can subscribe and win Josh V Kingsday outfit for 400 euro. Josh V engagement raises up to 170%. Coolcat, Josh V and Miss Etam combine trend T.1 “Events” with T.2 “Winning mechanism” and score better than the brands, which used just T.1. 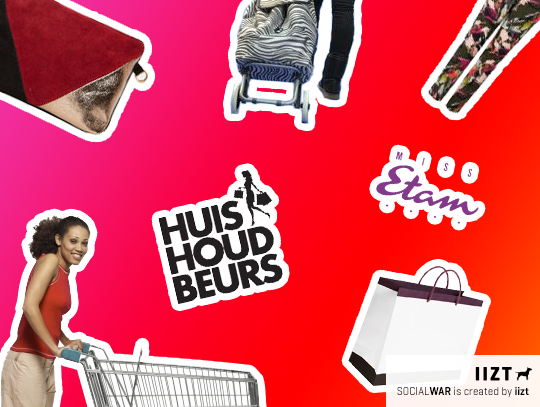 Miss Etam is using the same women from Huishoudbeurs for their winning action, offering to their Facebook fans to vote for the best outfit and get a chance to win a 75 € shopping card plus a makeup set of Deborah Milano. Miss Etam knows how to encourage their most active women fans! WE Fashion was the smartest with their winning mechanism. WE Fashion gives one year of free denim, but gets back much more. 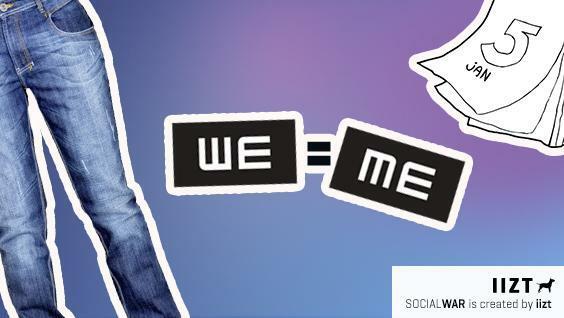 By asking their customers to follow three simple steps, WE Fashion has raised brand awareness, increased an engagement to 200%, got new members to “WE IS ME” club and a lot of new e-mail to their database. Very productive! Read here, about 3 simple tricks of WE Fashion. Video content is a key to online marketing success of many fashion brands. 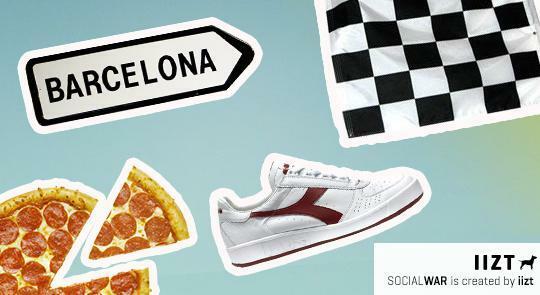 MS Mode and Diadora are actively using video content to inspire its target group. Video is much more interactive than text. Audience prefers to watch, not to read. MS Mode’s plus- size models are happily presenting MS Mode’s sport line in a short video on Facebook. Diadora shows some beautiful parts of nature on the way from Diadora HQ to Barcelona. 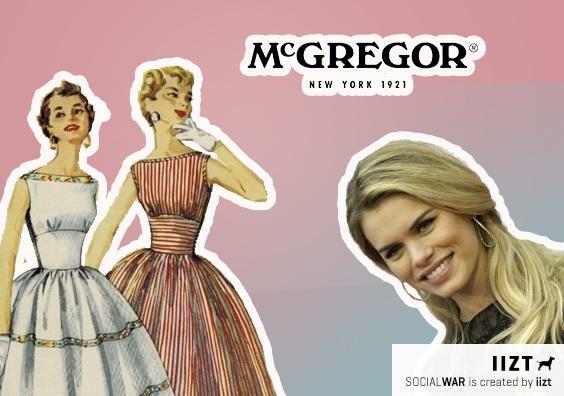 McGregor shoots weekly videos for their online Weekly Style blog, to present their collection. G-Star Raw is actively posting videos with Pharrell Williams announcing takeover of G-Star Raw Instagram or small record of his visit in Amsterdam. 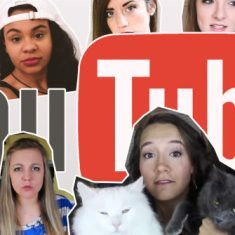 When it comes to potential reach video is your best option, that’s why many brands are actively using it. 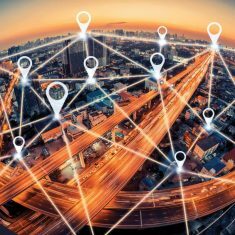 Read more about video content. Celebrity marketing is one of the most effective ways to get the attention of the target audience. When a brand picks the right celebrity for their brand, celebrity’s success becomes a brand’s success. The perfect match of G-Star Raw and Pharrell Williams. 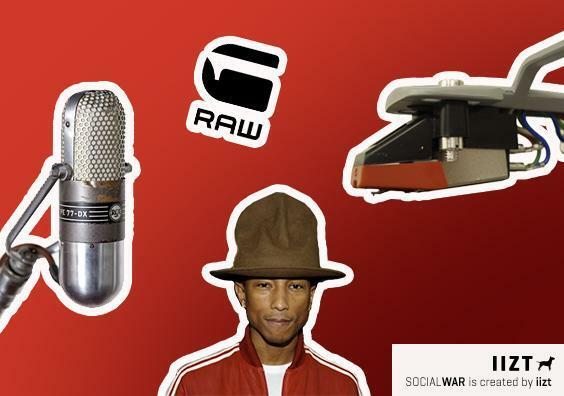 G-Star Raw winning action for Pharrell’s fans and video of Mr. Williams is visiting G-Star Raw’s factory in Amsterdam gives the brand an increase up to 155%. Leonardo Dicaprio is winning his Oscar, wearing Armani suit in his moment of triumph. 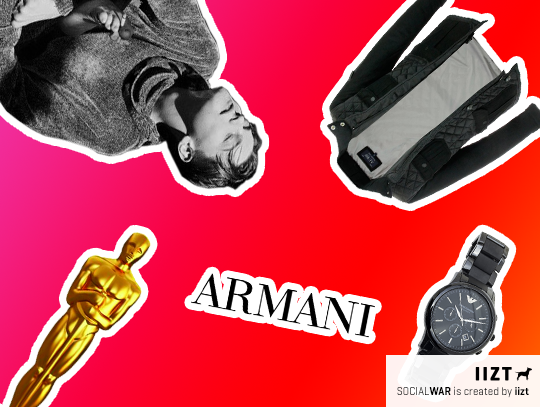 Armani is winning as well and has an increase of 145% in engagement on their Facebook page. Elegant traditional Dutch woman, girl next door, Nicolette van Dam is bringing a certain image to Dutch brand McGregor, while Fila is scoring with the absolute opposite to McGregor’s feminine celebrity. Throwback to young years of Mike Tyson. Posted picture of a boxer holding a white pigeon has increased an engagement of Fila by 195%. Replay collaborates not just with one celebrity, but with the whole team. It makes the brand the best performer of this month. Replay and one of the best teams in the world FC Barcelona. During the last week of March this co-operation gave an engagement increase almost 520%. 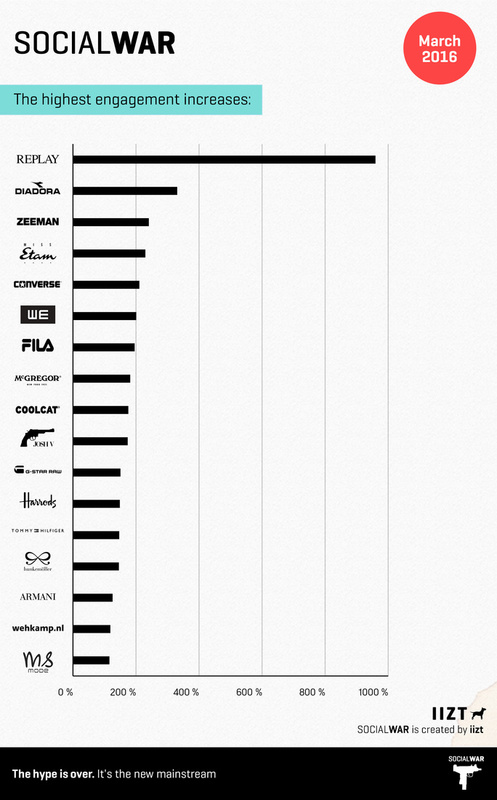 Moreover, Replay uses the latest trend many fashion brands score with now. It’s a combination of sports and fashion. Zeeman has created the book “26 puntjes van kritiek”. 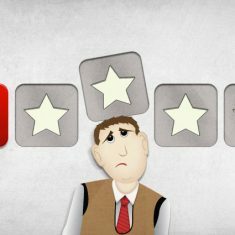 (26 points of critique) That is how they get to know their audience. Zeeman has an open communication with the customers, telling everything about the production process, materials and prices. 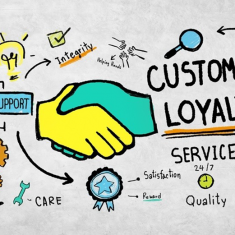 Combining customers’ questions and complaints in one book they tried to be as much opened with their customers as they can with their answers. Customers, of course, appreciate it. McGregor not just understands who is their potential customer, but also smartly uses dark Facebook posts, targeted to the specific groups of its followers. As a result, McGregor has an increase of engagement up to 180%. Read here how to use dark posts. 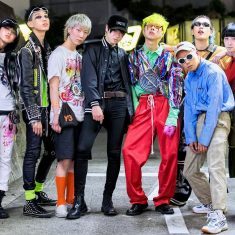 Fashion brand Converse understands their potential group very well. Young, wild and free. Millennial generation. Teens love their Chucks and Converse knows the way to get them on Converse’s Facebook page and increase the engagement to 125%. Trend 6 Sport & Fashion. Looks like people are really inspired by the sport and eager to sport achievements. Diadora generated their engagement to 375% last month with their inspiring campaign #makeitbright. 70 runners, 10 countries, 1500 km across Europe. People of different nationalities, races, genders and age generations are following the route just to deliver a pair of shoes. All these people are united with one love to sport and it helps them to overcome this distance together. Diadora shows people the clear idea and philosophy and motivates their followers to new sport achievements. MS Mode follows a popular trend: the integration of fashion and sports. 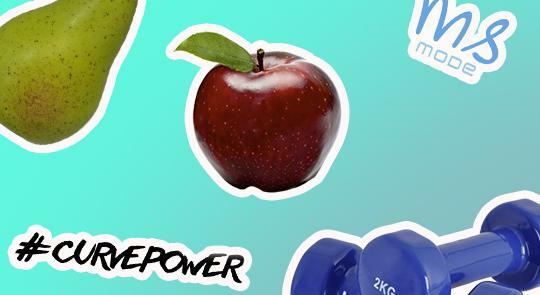 MS Mode launches its own sports collection and gives its an extra twist with #curvepower. The Dutch fashion brand focuses on the full figured woman. The combination of fashion and sport and good knowledge of the target customer has increased MS Mode engagement to 125%. Converse scored consistently high. This time the brand scores just simply with a product. Just a post with just shoes. No stars, winning actions or other tricks. Back to basics. And that is catching on (129% engagement increase). The same does G-Star Raw and has an engagement increase with its basic by more than 118%. 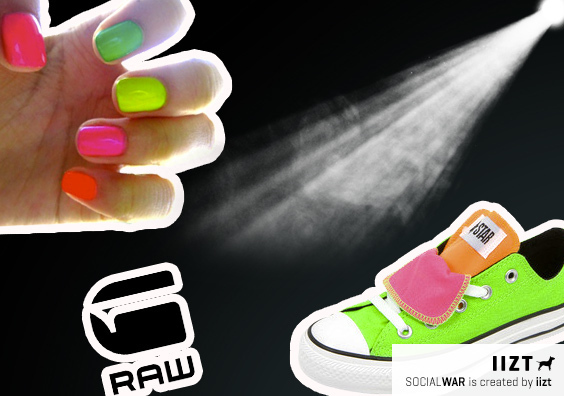 Converse combines these two from the first side not combinable trends and increases their engagement to 125%. 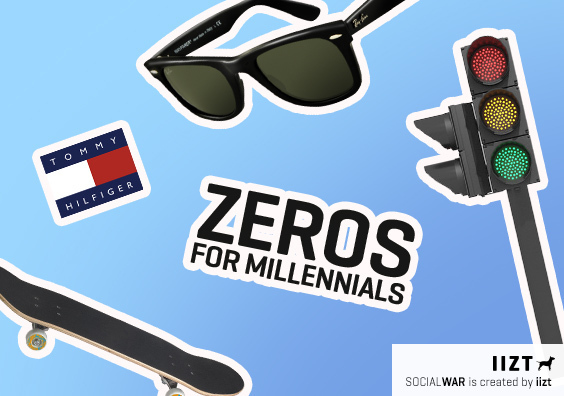 Converse understands the millennial generation and their hero’s. Teens are so far ahead of the crowd with their social media activity and apps usage. New times. New apps. New idols. 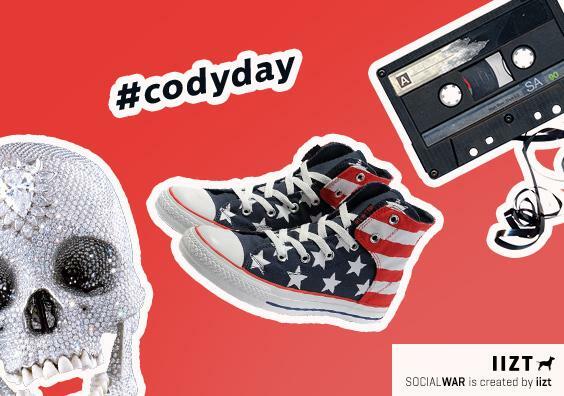 In March Converse paid tribute to the talented muser (user of musical.ly, app for creating short singing, dancing, comedy, and lip-syncing videos) Cody Cohen, a millennial’s idol who tragically passed away. Cody still has 470,5K fans on musical.ly and it keeps growing even after his death. He was one of the self made online hero’s. 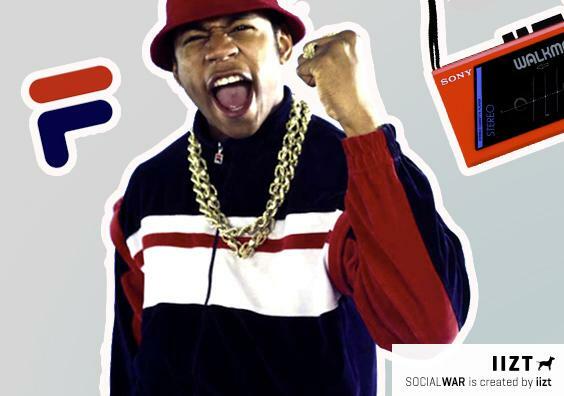 Converse feels the stream and adapts to the newest trends of millennial generation. Using hashtag #Codyday Converse asked to share a photo of Chucks to pay tribute to Cody. All the youngsters (a potential group of Converse) put their Converse shoes on and filled all the social media channels with their pictures. Tommy Hilfiger understands the millennials as well, using such models as Hailey Baldwin, Luka Sabbat and David Bywater, who are being that “cool teens”. Moreover, the photo shoot for Tommy Hilfiger is also made by young photography star Bryant Eslava, who started his career being 16 years old. Engagement of Tommy Hilfiger grows to almost 150%. Online presence and influence of youth is rapidly growing and becoming a trend nowadays. As a brand you need to adapt to it. If it is about Art and Creativity it is about Converse. The brand is supporting young musicians, modern designers, urban climbers and artists. Converse is always #readyformore. In the latest campaign a globe-trotting street and urban contemporary artist from Barcelona “El Arte Es Basura” (Art is Trash) animates the huge abandoned hotel building in Croatia. 500 liters of paint, 942 kgs of trash, 360 meters of tape, 6000+ sq. meters painted, 133 “new hotel guests” after 25 spent hours. It is an incredible idea and art work. 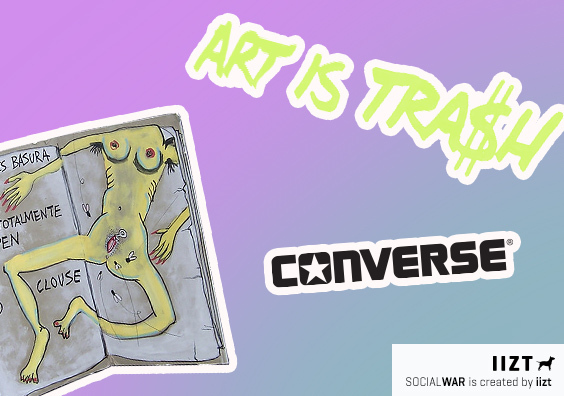 Cooperation with an artist gives Converse an engagement increase 210%. 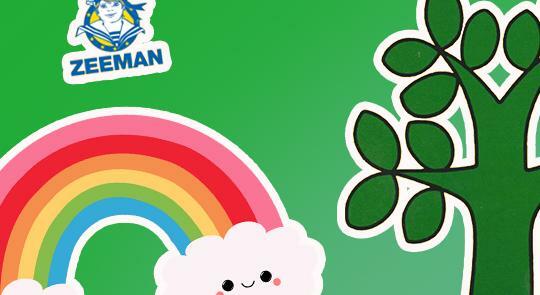 Dutch yellow-blue brand Zeeman is becoming “green”. But it is not about changing the logo. 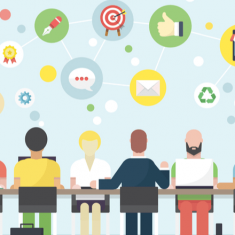 The leader of the month February is starting to position itself as a fighter for the environment and implements circular economy in their strategy. People like the idea of green technologies and them supporting the brand, that fights for the world. 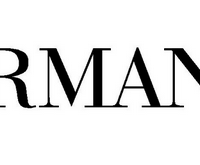 It brings Zeeman an engagement increase up to 330%.